©John Glass, Boat Yard. Oil, 6 x 8 inches. John Glass completed his studies in architecture at Boston’s Wentworth Institute. He developed his artistic style through active painting over a more than 30-year period. He studied primarily under artist-teachers Marshal Joyce and Edward Harrigan. His subjects, both in oil and watercolor, are rendered with loose and colorful strokes, showing the buildings, marshes, and scenic shores unique to Cape Cod. John’s paintings are in public and private collections, and his many awards include Best-in-Show at South Shore Plaza multi art-club shows, and at the Quincy Marina Bay Yearly Arts Affair. He is a popular guest artist, speaker, and judge at numerous art clubs, and has conducted on-site workshops. 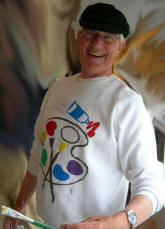 John has been an active participant with a number of South Shore art associations. 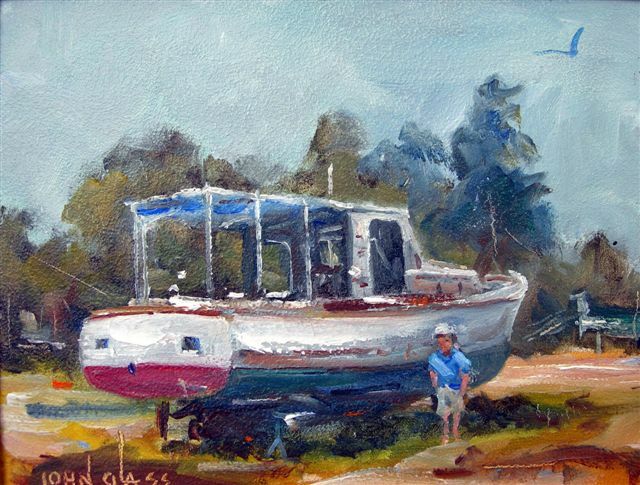 A member of the Guild of Harwich Artists, he paints and exhibits in the Guild’s summer Art-in-the-Park event, and is a member of The Gallery of The Guild of Harwich Artists in Harwich Port. He maintains a home studio in Harwich.